My advice: sell them. I'm serious. I'd buy it yesterday. How in the world did you get such a great deal on the lens? I'm looking on ebay and the cheapest I can find is $60! Still much cheaper than a TS lens, but far more than the $11.50 you paid. Has there been an upswing in purchases for DIY TS users??? Anyway, this looks awesome. I read about making your own in Make Magazine some time ago, but have finally decided to do it. I would use this for landscapes but also portraiture, including child portraiture. So I need something that won't take a lot of fiddling, since children aren't exactly known for their ability to sit still. I was thinking of using your first design but subbing in the T-mount to make it more robust. Would that work? @Shana: yeah, it took a bit of looking on eBay to find the lens - it took about a month on and off of searching to find one under $50. I bought it off someone who was selling all sorts of assorted stuff, and they didn't seem to really know how much the lens was actually worth. It's worth looking for misspelled entries on ebay too. Another good resource is keh.com, but you have to be pretty fast to snap up a cheap lens. Excellent, thank you so much for your feedback. I'm not known for my patience, so I may just spend the $60 and be done with it! I'll go forward with the t-mount, and definitely drop you a line to let you see the results. And if you'll entertain another stupid question ... since the lens isn't in contact with the electronics of the camera (and isn't compatible anyway), how does one control the aperture? In the Make article (with a somewhat similar design to yours) it said the apertures would still work, but that doesn't make sense to me. I would probably want to leave it at 2.8 all the time anyway, and I think that's what the lens defaults to, so do you just stick it on and go, and know it will be at 2.8? You might be able to select the aperture using the ring, then hold the button down using a tight rubber or something similar. I have been ogling Plungercam 1 for a long time. I haven't been able to repeat the feat simply because I couldn't find a similar type of bellows. But the one you used for Plungercam Mk 2 may well be available from the hardware store here. @RML: the t-mount is just much, much stronger than the body cap. I used the plungercam pretty heavily over the period of a few months (see here) and the teeth on body cap itself just started to disintegrate under the load. 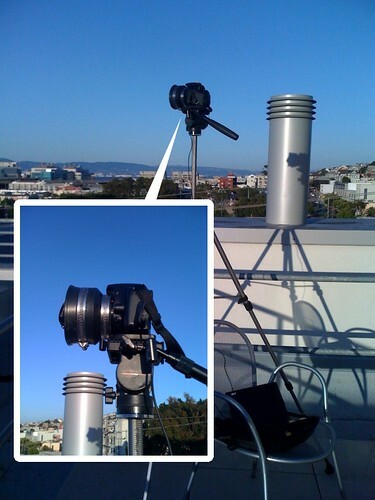 The t-mount is made of good, solid machined metal so I'm expecing that it won't have the same problem. Thanks. I ordered a T mount just now. :) Tomorrow I'll be on my way to the hardware store. wow, too cool, thanks for taking the time to share, truly inspirational!! all the best!!!! Completely brilliant! Love the effect you get. The first version was the usual hold the lens stuff, but now it looks better useable. Good Idea! Because I'm using a Hasselblad for my experiment, I had to find a strong enough mount to start with. For that reason, I decided to get the Hasselblad Microscope Adapter. Starting with it I should be able to proceed from there without issue. But I'm glad to have finally gotten around to looking up what a plunger-cam is, to have a better idea of how to complete my project. I just got my Minolta DLP Projector lens! It's so F'ing BIG, it's CRAZY!! It's about the size of a 300mm F/2.8 or maybe even larger. When I hold my Hasselblad body directly up against the rear end of the lens, I can focus the image in the viewfinder. Although there is some vignetting. But what I really got this for is my 2/3" CCTV camera. There won't be ANY vignetting when used in that application. And the image will be incredibly bright. I only have to determine the mounting thread size of the lens now. It looks to be somewhere around 4", with a 1mm pitch. 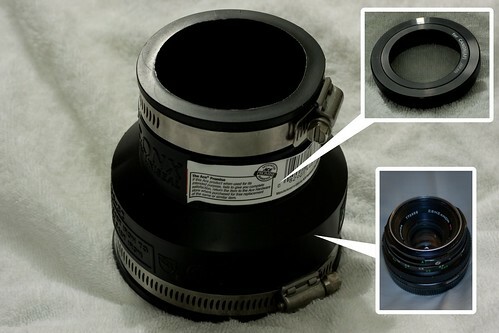 I think it may be the standard 4" projector mounting thread, like what I have on another lens for projectors, 101.6mm. I'll definitely be looking for me of these lenses! How big is your lens? 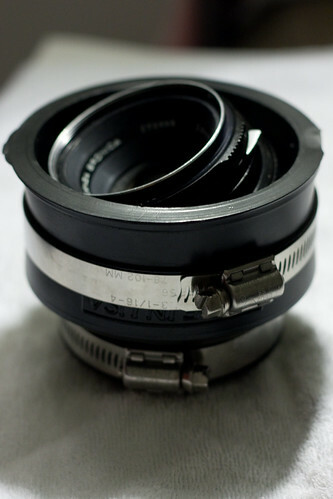 I bought a Mayima 80mm f/2.8, and its outside diameter is about 2", roughly the same as theT-mount. 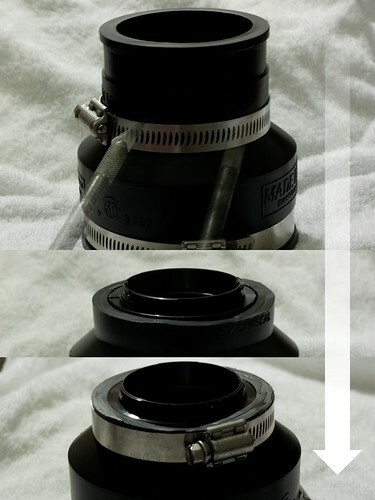 I bought a 2" to 3" coupling, but the 3" end is way too big for the lens, even if the lens is inserted at an angle. I haven't cinched down with the clamp yet, but I'm not sure I can get it small enough. @gthorne - an option is to simply pad the inside of the 3in end with rubber sheeting - I've seen a couple of plungercam 2 builds that have done this for lenses that are too small. i need to ask. what kind of lens suitable for this project? my nikon 50mm 1.8d can work with this? 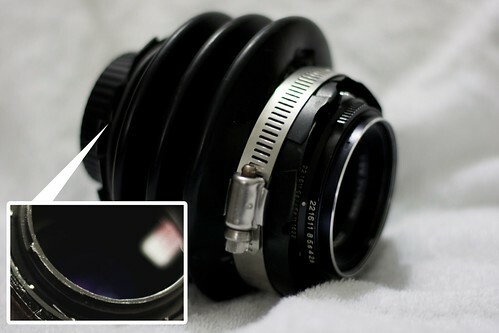 ...I've got details on how you can adapt an existing 35mm lens to build a DIY tilt-shift lens. hi i've a question to ask you. i found the bronica 75mm f2.8 lens its like...few hundred, and i was thinking what if i use the other lens that was on the other DIY tilt lens ? would it work ? anyone feel free to reply, Thanks heaps ! Brilliant design! Thanks for sharing. I've followed your instruction with exactly same parts that you've used. However, my plungercam 2 cannot focus at infinity. Does yours have the same issue? @Jiang: I think your problem is that the lens is probably not close enough to the camera body. What is the dimensions of the pipe coupling that you are using? I've thought about the same reason. What puzzled me is that I used the same pipe coupling you've recommended, a 2"X3" flexible coupling. I also cut the narrow end as short as possible to accommodate the pipe clamp. I've thought about the same thing, which is why I asked you if you had similar issue. The pipe coupling I used is same as the one you used in the tutorial, 2" X 3" flexible coupling. Also following your recommendation, I've cut the narrow end to the shortest possible to accommodate the 2" pipe clamp. I only have a nikon d5000, I read on another comment that a cmos might not be the best. Will I be able to use this build on my d5000? @speejack: The quality of the sensor shouldn't affect this build. The primary factor here is sensor size - the d5000 should be fine. your assistance is very impressive!